I don't know of it but it looks very interesting. It looks a bit like something that a child could sit and play on. Is it a bronze statue of a lion and a serpent that someone has taken upon himself to paint (vandalise)? I did indeed sit and play on this lion as a child, as did many other children, as the serpent was handy as a backrest to stop you sliding off! It wasn't bronze, but stone. I read somewhere that the statue was originally in a garden in Headingley and was then moved to the park. At the bottom of the lion's front paws there was a date carved, June 1862 (or possibly 1863). The lion sat peacefully in its spot near the tennis courts (round the back of the bowling green) until the 1970s, when students started to paint it various colours, including at one point a vivid shade of pink all over, which prompted me and my friends to christen it Floyd! Unfortunately the painting escalated to general vandalism and the end of the tail was broken off, followed by the part of the serpent which went from the lion's back to the base of the statue. Eventually the rest of the serpent was smashed until the statue looked so bad that it had to be removed. That was a sad day for me and it was a shame that people couldn't respect something which had been there for so many years. 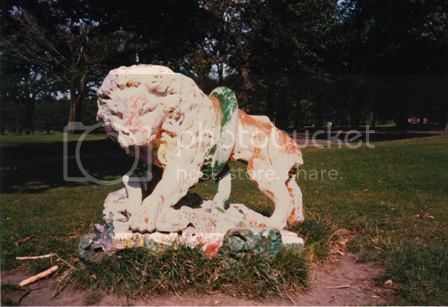 Here's my photo of the lion, taken some time in the 1980s, after the tail was broken but before the serpent was damaged. I would love to know more about its history but have been unable to find out anything. It's dated too late to have come from the Headingley Zoological Garden, as that closed in 1858. I never knew of it. Sad really, part of me wishes they were all corralled into a museum. But then the magic as a kid of interacting with them is lost. The following article was published in the Leeds Times on the 9th June 1883. It’s an account of how the stone lion came to be on the Moor. A CREDITABLE PIECE OF WORKMANSHIP has been placed on the new rockery on Woodhouse Moor. The idea originated with Mr Benjamin Sharp and his co-workers engaged on the stone carving in the interior of the Leeds Municipal Offices. They wished to show their appreciation of the efforts to improve the moor and in gratitude to the Leeds Corporation for the work found for them at the new building. That work is now drawing to a close, and this specimen of their abilities will mark the year when the building was completed. Mr Sharp prepared a neatly-designed and spirited model of “The Lion and the Serpent.” A splendid block of stone, more than three tons weight, without a flaw, was procured from Scothall Quarries, Potternewton, belonging to Mr Joseph Pickard, Jun. The stone was conveyed to a shed in the yard of Mr James Wood, builder, Thoresby Street, Leeds, who is the constructor for the municipal buildings, and there it has been carved by Mr Sharp and his fellow workers, the “lion’s share” of the sculpture falling to Mr B Sharp. The stone measures about four feet square. The figure of the lion is 5 feet 8 inches from the tip of the nose to the root of the tail, and the latter, curled on the body, is 3 feet long. The entire length of the serpent is 17 feet. The lion stands about 3 feet 8 inches in height. The pedestal or base is composed of rocks, interspersed with ferns. The lion is full of action. Finding himself in the coils of the serpent he is in the act of springing forward. Once round his body and twice round his right leg has the creature entwined; but, in the act of striking to sting the noble fellow, the latter has placed his left paw firmly on the neck of the serpent, crushing its body, and it is evident that the lion has the best of the encounter for life or death. Just at this moment the noble brute – startled by hearing something else approach – looks eagerly in the direction whence the sound came, and with glaring eyes and open mouth, displaying an array of terrible “grinders,” shows that he means mischief. This idea is capitally caught, just as if the lion thought, “I have scotched one enemy, and am ready for another.” The animal’s fore quarters are slightly elevated in treatment, as he stands amongst the rocks, and his extended claws testify that he is dealing with a deadly foe. The foliage of ferns is boldly conceived. The sinuous motion of the serpent is skilfully managed, and projecting from the mouth is his terrible sting, now powerless. The head of the lion is finely portrayed, and his whole body is full of energy and life. Mr B Sharp and those who have assisted him may be warmly congratulated on the outcome of their efforts. With them it has been a real “labour of love,” wrought out in their leisure time, and has called for no small amount of self-denial, not a penny having been charged for the time spent on the work. Thanks to the generosity of Mr James Wood, the lion and serpent was placed on one of his spring wherries, and yesterday morning it was conveyed to Woodhouse Moor and placed on the centre of the rockery. Our readers will have the opportunity of seeing for themselves what the unaided efforts of the carvers who have adorned that magnificent staircase at the municipal offices can accomplish. The weight of the completed work, when placed in position, was upwards of a ton.